We brought the iced cake to class. This time I made a 9" square with chocolate cake on the bottom and vanilla butter cake on the top, with cream cheese filling. The outside was iced with vanilla buttercream. In class, we covered the cakes in fondant, and also practiced roses made with stiffened fondant. Stiffened fondant has a gum added to it (like Tylose or Gum-Tex) to make it more of a fondant/ gum paste hybrid. This makes it easier to sculpt because it can support its own weight a bit better than regular fondant. We made the curlicues by wrapping fondant strips around a dowel rod, sliding them off, and letting them harden. There was a flower cutter in the course kit, so we could just roll out the fondant and cut those out. Similarly with the polka dots, only we used the end of tip 12 to cut those out. I did my cut outs before class, so for some of the white polka dots, I let them dry and painted them with super gold luster dust. Everything was attached with water or clear vanilla. Around the bottom of the cake is a tip 5 bead border. Next week in this class we're doing royal icing flowers, specifically throated flowers, including petunias, lilies, and morning glories. In the final class we'll be making a 2-tiered cake with pillar dividers. Also, today I started a wedding cake class at the Cake Art store. Today we did some fancier buttercream techniques, like embellished borders and stringwork. 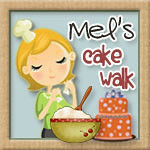 Next week, we're discussing wedidng cake construction, delivery, pricing, etc. Then, in the final class we'll be making a 3 tiered wedding cake! I'm so excited for lilies!